An entry of 1,250 sheep in Markethill on Wednesday 23rd May sold in an easier trade for both spring lambs and cull ewes. Breeding sheep trade remained steady. Nearly 500 spring lambs sold to a top of 520p per kilo for 20.2 kilos at £105 each followed by 510p per kilo for 20 kilos at £102 each. Main demand from 480p to 504p per kilo. Heavier spring lambs sold from 450p to 485p per kilo for 23.5 kilos at £114 each. Several pens selling from £115 to a top of £120 each. 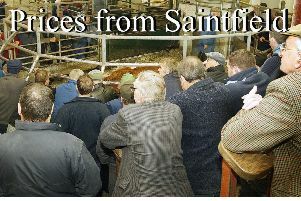 Over 300 cull ewes sold to a top of £100 with all fleshed ewes selling from £75 to £94 each. Plainer ewes sold from £50 to £70 each. Another full yard of breeders sold readily with doubles selling to a top of £218 with several more from £180 to £215 each. Singles reached £185 with several more from £160 to £175 each. Markethill farmer: 20.2k, £105, 520p; Loughgall farmer: 20k, £102, 510p; Poyntzpass farmer: 22.6k, £115, 509p; Whitecross farmer: 22.4k, £113, 504p; Collone farmer: 21.6k, £107.50, 498p; Whitecross farmer: 21.5k, £107, 498p; Glenanne farmer: 19.5k, £97, 497p and Loughall farmer: 22.5k, £111.50, 496p. Richhill farmer: 23.5k, £114, 485p; Newtownhamilton farmer: 24.3k, £117, 482p; Armagh farmer: 23k, £110, 478p; Armagh farmer: 23.2k, £110, 474p; Portadown farmer: 23.7k, £112, 473p and Benburb farmer: 23.1k, £108, 468p.